Nico Salva who had 19.5 points per game via a 78 percent Field Goal shooting in the UAAP Season 74 Men's Basketball Finals for the of Ateneo De Manila University was named UAAP 74 Finals MVP. His amazing performance in the finals which was highlighted by his 13 straight field goals made enabled him to get the award. But above all those individual feats, Nico was able to help the Ateneo Blue Eagles get their Fourth Straight UAAP Title at the expense of the FEU Tamaraws. 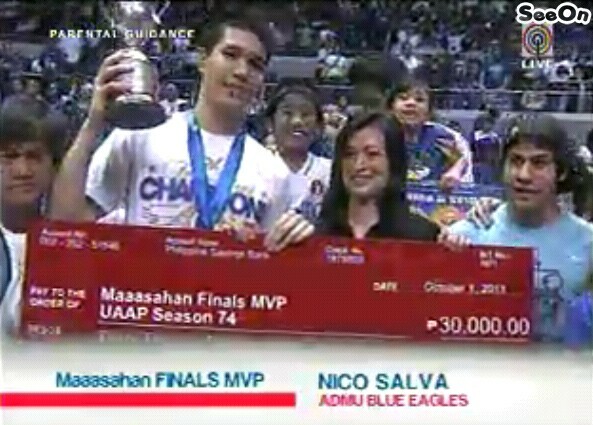 The Blue Eagles won the best of 3 Finals Series against the Tamaraws, 2-0. The final score in the second game was 82-69 in favor of the Blue Eagles. Nico Salva and Greg Slaughter stamped their class right from the very start of Game 2. Together they pushed Ateneo to grab the driver seat early in the first quarter via a 14-11 score. They ended the first quarter on a high note as they established a 5 point lead, 23-18. In the second quarter, FEU made a run to cut Ateneo's lead. The Tamaraws' ace player, RR Garcia a three pointer and Chris Exciminiano anchored FEU's run and gun style of play as they grab the lead from Ateneo. But Ateneo's inside rebounding and fast break scoring were just too much for the Tamaraws. Due to that dominance the Blue Eagles were able to cut FEU's lead down to 1 point, 36-35, at the end of the 2nd quarter. In the 3rd quarter, Juami Tiongson, Tonino Gonzaga and the rest of the Ateneo's 2nd stringers did a great job in scoring and in defending FEU's gunners. They enabled Nico Salva to do his thing on the floor. Salva once again made an impact as he scored 4 straight points to make the score 39-38 with 7 minutes left in the 3rd quarter. Kirk Long and Kiefer Ravena also pitched in 6 quick points to make the score 45-38. Tonino Gonzaga meanwhile ran like a bull as he made an and 1 play to increase the lead of Ateneo to 11 points, 49-38, with 3 minutes left on the clock. Since that heart pumping run, Ateneo never looked back and they never gave FEU a chance to grab again the lead from them. They virtually dominated FEU in terms of scoring and in terms of rebounding in the last minutes of the 3rd quarter up to the final buzzer in the 4th quarter. The final score was 82-69. As a consequence of this big championship, Ateneo is now one of the elite schools in the world of UAAP basketball who have won 4 straight UAAP championships. UST did the feat during 1993 up to 1996 UAAP Seasons, UE did it during the 1965 up to 1971 UAAP Seasons, DLSU did it in the 1998-2001 UAAP Seasons and now, ADMU did it in the 2008-2011 UAAP Seasons. On a special note, Ateneo's graduating players- Emman Monfort, Bacon Austria and Kirk Long played well in this game. They will definitely be remembered by their fans. God Bless guys!